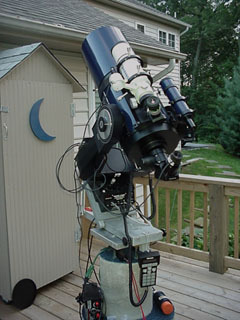 The only way to see above the trees in my location is to set up the telescope on the deck. Unfortunately, this does very bad things when trying to do a polar alignment since the deck planks flex a bit when you walk from one side of the scope to the other. In this photo, the deck has been extended and the form for the base of the pier is in place. Pier base has been poured and the rebar core of the column can be seen going up through the hole in the deck. The base is a 4 foot cube, about 34 inches under ground, 14 inches above ground, weighing an estimated 4 tons. The ground is virgin granite, clay, and shale. 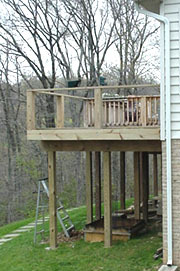 The deck was extended 12 feet in order to honor my wife's request that we not lose any space in the existing deck area. Once I had measured to see what space must be enclosed, the emerging design very obviously resembled that "little house out back" from more primitive days. So, not being one to tempt the gods of levity, the "scope coop" has been renamed the "outhouse"! Appropriate ornamentation was a must. Tucked away inside, but quickly ready for action - our 8" LX200. The outhouse is on wheels, and once the critter panel at lower front is removed, it can be wheeled out of the way easily. 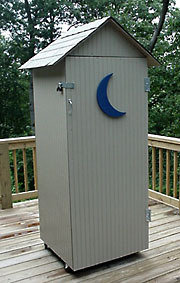 The outhouse can be rolled out of the way anywhere on the deck. The pier column weighs an estimated 2.5 tons and was poured with a 3 inch PVC pipe running to below deck. 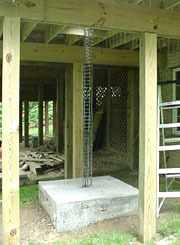 Wiring is run through the pipe, under the deck and into the house. 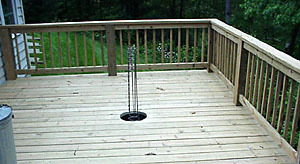 The pier is isolated from the deck to eliminate vibration. So far, this seems to be a very workable setup - I'll know more after we've used it a couple of months. My thanks to MAPUG members who offered many suggestions and ideas. This photo was taken after I added a Takahashi 60 mm f/5.9 scope to the setup. 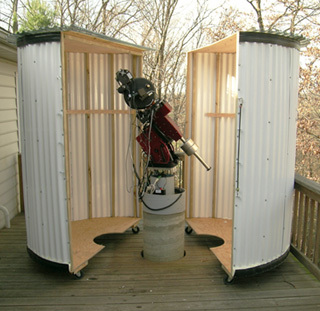 When I upgraded to a Celestron 11" SCT and a Takahashi 90mm refractor, the original "outhouse" had to be replaced. We don't have a good name for this one..possibly the "monolith" - it certainly isn't as romantic as the "outhouse"! 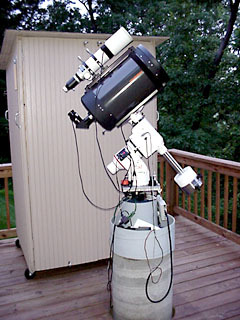 Pictured here is a Williams Optics HD mount. 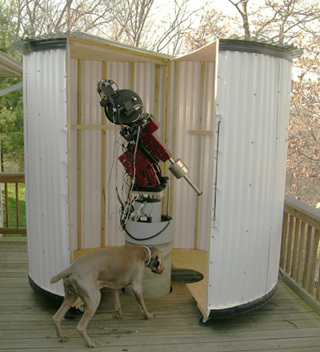 This shot shows the shed open and rolled away from the telescope. The newest mount, the Paramount ME1100 is also shown. 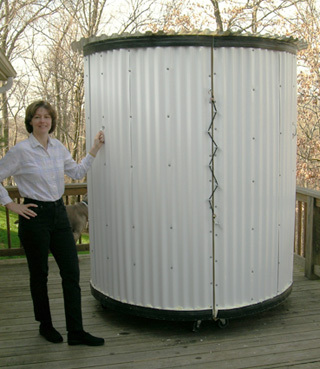 Ok, this design (dubbed the "silo") just sort of came to me one day - the idea was to make a larger, but lighter, structure, and to do away with the "let's roll this big tight fitting box around the telescope in the dark without bumping anything" adventures. And yes, it's "laced" together. I also needed to make room for another OTA upgrade without significantly increasing the foot print of the enclosure - the silo seems to have done that. The lovely model is my wife and astro-mate, Carol. 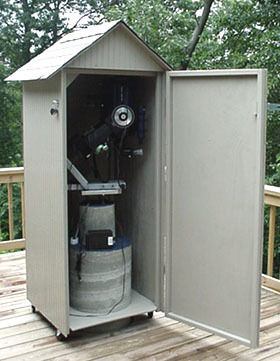 The silo opens after removing either one or both bungie cords and rolling the halves away from the scope. I often leave one "hinge" in place and just open the silo enough to use the scope. Closing things up is also easy since the cutout for the pier provides self aligning, and there is virtually no danger of hitting the scope or mount. About to put his "stamp of approval" on the silo is astro-dog, Maxx. 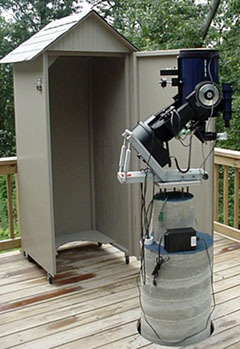 The 2 halves of the silo can be completely separated and rolled to the other end of the deck to really free up space around the scope. 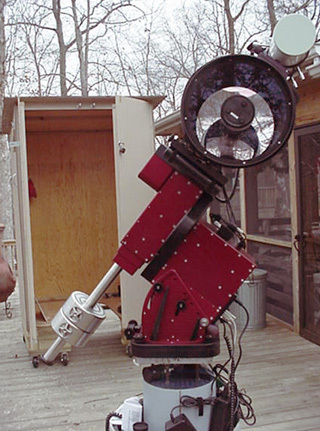 This picture shows the C11, Tak90, ME1100 mount, JMI NGF-S focuser, and ST-2000XM camera. 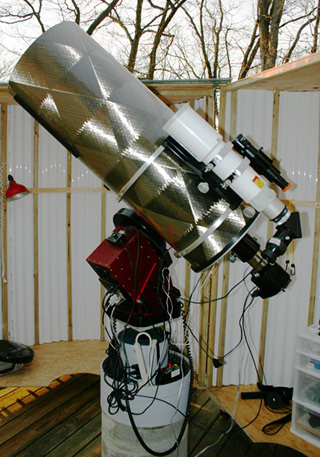 On March 9, 2004, I replaced the Celestron 11" with this 12.5" f/9 Ritchey-Chretien from Optical Guidance Systems - the tube is wound carbon fiber. First light views were exceptional! In 2009 I decided I was done with astronomy - for a lot of reasons...well, it wasn't to be so. Since then I've bought and sold several scopes. 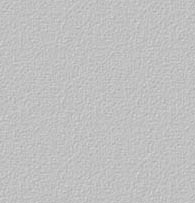 Among them a C 9.25, an NP101, and this NGT 12.5 from JMI. 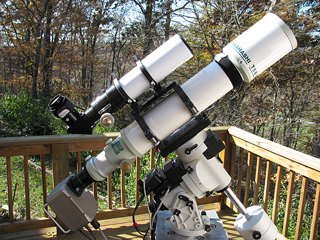 This was a really nice and fun scope...and portable, too! 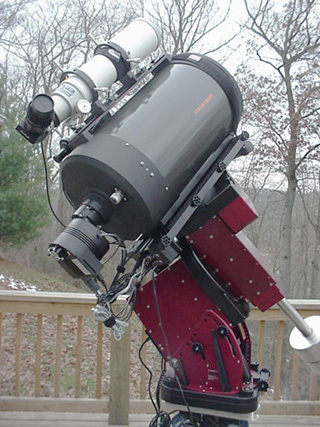 So now, as of late 2010, we have a Celestron CGE Pro mount and a Celestron 14" HD Edge scope. That's a William Optics 80mm guide scope on top. Barely visible are the 80 lbs of counter weights! 2011 - Things keep changing. I needed a more portable rig since travel seems to be on the agenda. 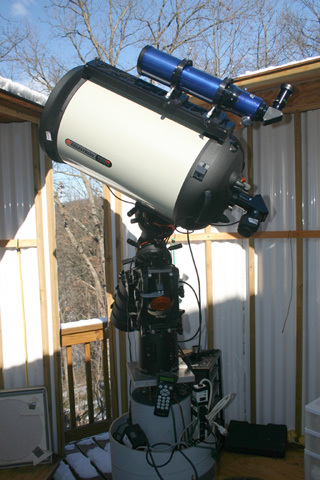 Takahashi TSA102 f/8 refractor, Stellarvue SV-70 guide/finder scope, STL-11000 and ST-i cameras, on an iOptron ieq45 mount - soon to be equipped with a Telescope Drive Master (TDM).